The Trump administration directed mapping specialists at the Bureau of Land Management to exclude coal deposits from the revised boundaries of a Utah national monument "regardless" of the outcome of an Interior Department review of the site, according to an unredacted Office of Inspector General report. The disclosure came yesterday during a House Natural Resources Committee hearing focused on President Trump's decision to roll back monument protections on more than 2 million acres of public lands in late 2017. California Democratic Rep. Jared Huffman revealed the directive when he read aloud from the OIG report to contrast testimony about the monument review process by BLM Utah State Director Ed Roberson. "Mr. Roberson, you have in your testimony portrayed a process by the Trump administration that you hold forth as honest and exhaustive. ... The inspector general's report portrays a very different process, one that began not with a careful balancing and a receiving of input but rather with some political decisions," Huffman said. He went on to detail testimony from a BLM geographic information system specialist who told OIG investigators that he was directed to reduce Utah's Grand Staircase-Escalante National Monument to no more than 1 million acres in size and to exclude "certain coal leases from 1996." Huffman said the GIS expert asked whether that exclusion should ignore other protected objects, such as paleontological resources. The GIS expert stated: "These coal areas are all pretty high dinosaur resource areas. We were told they're out regardless." The monument ultimately lost nearly 862,000 acres, about half of its 1.9-million-acre footprint. The southwestern Utah site has been a point of consternation for the state's politicians since then-President Clinton established the monument in 1996, locking up massive coal deposits in the area's Kaiparowits Plateau while preserving cliffs, slot canyons and sandstone arches. Following the monument's creation, the federal government paid out $19.5 million to purchase back coal leases in the area. That included a $14 million Land and Water Conservation Fund payment to Andalex Resources Inc., which was prepared to construct the Smoky Hollow mine at that time. According to a BLM mineral potential report released last year, the Kaiparowits Plateau coal field is estimated to contain 62 billion tons of coal. Within the Kanab-Escalante Planning Area — the name BLM assigned to the acres removed from the monument — there is an estimated 2.4 billion tons of recoverable coal (E&E News PM, Aug. 15, 2018). "The value in that shale was not a little bit of coal, which you can find anywhere, it wasn't some incidental oil and gas, it was these dinosaur fossils that are unique on the planet," Huffman added. "And your process told this GIS specialist, 'Take them out regardless, regardless of their value.' I just want to suggest that is fundamentally antithetical to the type of open and exhaustive process that you have represented took place by your agency." The OIG released its public report on the Interior Department's monument review process in January. That version of the report did not include portions that Huffman revealed yesterday. The California lawmaker's office did not return a request for comment, and the full committee declined to provide a copy of the unredacted report. The OIG document — spurred by questions over whether former Interior Secretary Ryan Zinke gave preferential treatment to a Utah lawmaker who owns property abutting the monument — determined that although Interior did not previously have a formal review process for modifying national monument boundaries, it did develop and follow its own guidelines during the 2017 assessment (E&E News PM, Jan. 31). 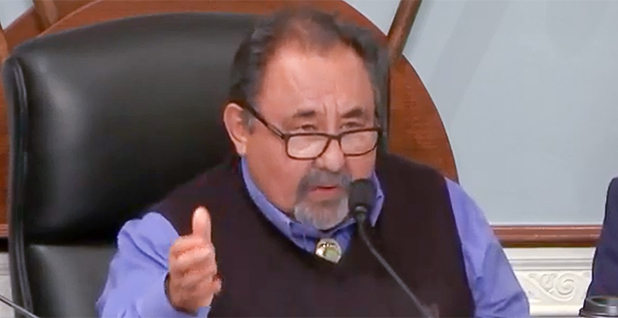 Chairman Raúl Grijalva (D-Ariz.) used the three-hour hearing to highlight what he characterized as the "forgotten voices" of the 2017 monument review, including Native American tribes and local businesses. An outspoken critic of the decision to shrink both Grand Staircase-Escalante and the Bears Ears National Monument, Grijalva called the Trump administration's process "hollow and improper." "It is my firm belief that this was a predestined outcome and that everything that has occurred since then has been to justify that outcome. I don't think it's justifiable," Grijalva said. But he rejected recommendations from Utah Rep. 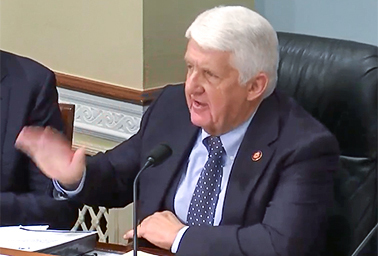 Rob Bishop (R) to focus on overhauling the Antiquities Act of 1906. That law allows presidents to set aside federal land as monuments to protect areas of cultural, scientific or historical interest. Bishop has proposed legislation that would sharply curtail the ability of presidents to declare national monuments in the future, including reining in the size of new monuments and requiring local and state government approval in some cases (Greenwire, March 12). "We should be talking about how the process of creating monuments ought to be done," Bishop said. Grijalva closed the hearing, however, stating, "The Antiquities Act is not broken. "If we begin with the premise that that is the fundamental fault here, then we're missing the point of the hearing and where we need to go from this hearing," he continued. "At the crux, at the center of this is the fact that this decisionmaking process left out stakeholders, voices weren't heard, and basic processes, including tribal consultation, were never as robust and as necessary as they should have been." The Arizona lawmaker added that he plans to pursue legislation to address the monuments, although he did not immediately offer specifics. "Any reforms and any legislation to try to make this situation whole is something we'll be exploring in the near future," Grijalva said. In an interview with E&E News, Grijalva added that he first wants to review responses to a host of outstanding inquiries to the Interior Department. "We're still waiting on information," he said, adding that the panel's interests are "tied into" the OIG reports that it has already obtained.